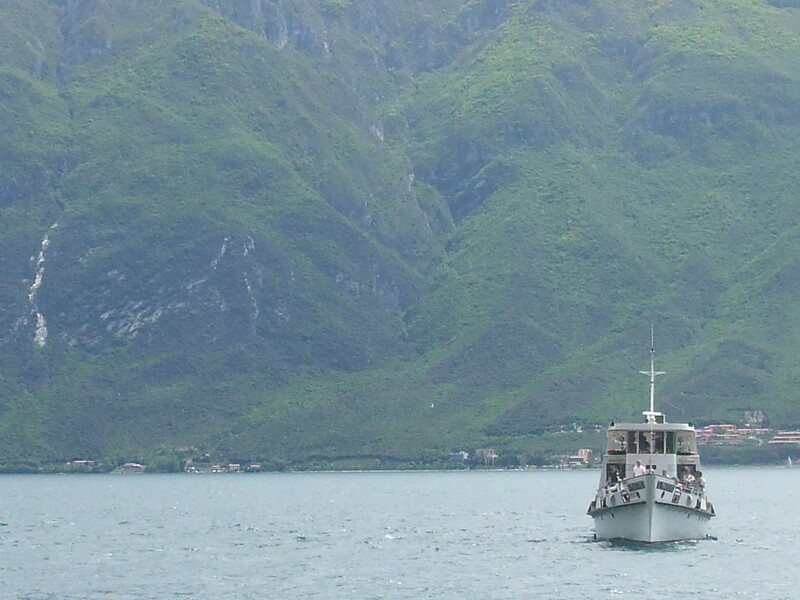 I was once told by a colleague not to take the boat all the way from one end of Lake Garda to the other. Too long on the boat, too much time on your hands I was told. 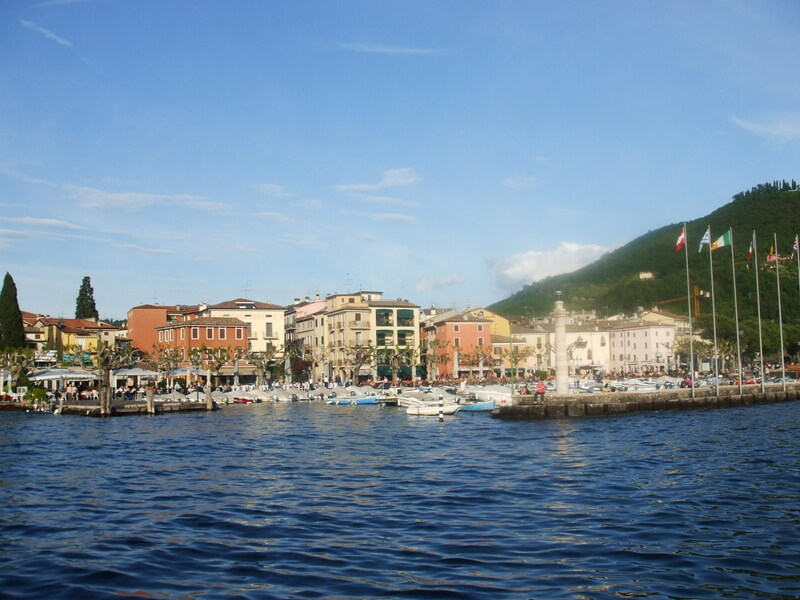 Admittedly it is the largest lake in Italy at 370 square kilometres and 54 km in length stretching from south to north. But nothing could have been further from the truth as far as I am concerned. My first and only journey on the waters of the lake was one of the most unique and memorable days of my life. It may have helped that I embarked on the fast boat on the outward trip as it was a Hydrofoil. 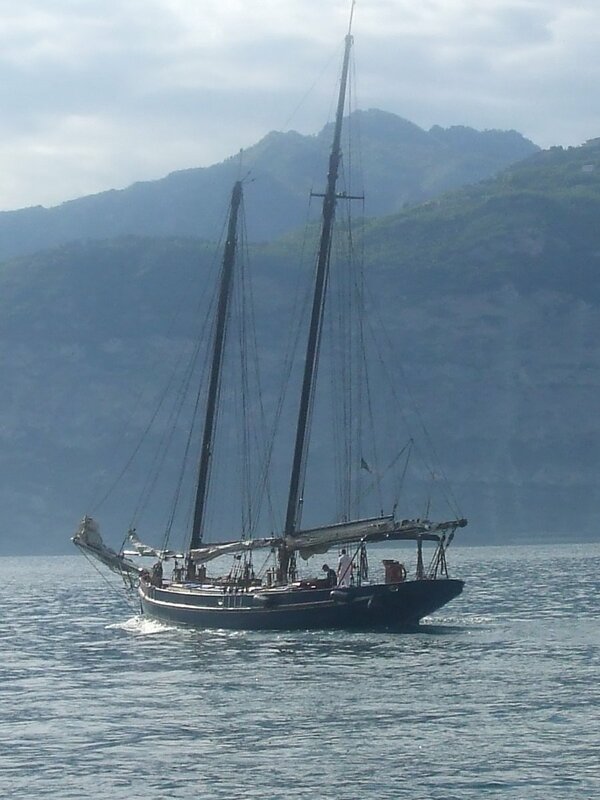 Not only a faster vessel but I also boarded at Bardolino which gave me a nine mile head start as the town is a little further up the lake than those on the southern shores. At this point the depth of the water at Bardolino is only 78m but this can deepen to around 346m further up the lake between Gargano and Brenzone. But it was still leisurely enough to allow plenty of time to absorb the lakeside scenery in all its glory. I stood permanently at the stern of the boat, initially gazing at the dancing plumes of foam that had been thrown together by the twin slipstreams. It was an almost perfect position in which to view the lake and the series of attractive towns at which we briefly berthed. Almost perfect as occasionally the fumes from the overhead engine exhausts on either side would catch in your lungs diverted by a capricious breeze or the turning of the wheel. I remained where I was, deciding that forebearance was the best choice in order to feast my eyes on the enfolding view the further north we sailed. I reckoned I could survive the fumes as it isn't everyday I indulge. I've cut down to two boats a day with the strong-willed intention of giving up the habit completely. And so I was not denied the opportunity to offer a cheerful wave at passengers cruising past on other boats or admire the small flotilla of white-sailed yachts as Sunday sailors enjoyed the warm mid-May weather upon the sparkling waves. 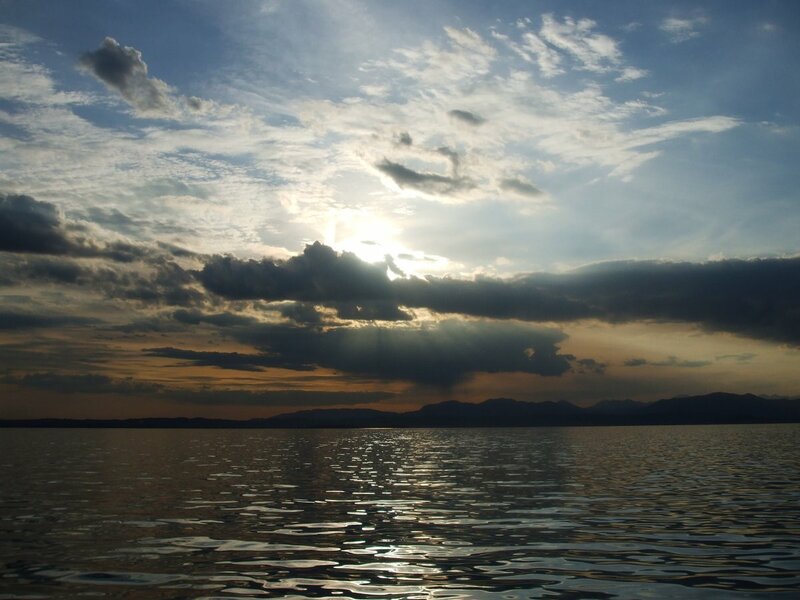 The land on the south-eastern part of the lake is flat which provides little in the way of outstanding scenery. However it consequently offers miles upon square miles of real estate in which to house the tourist trade and the many attractions, communications and amenities necessary to service the industry. 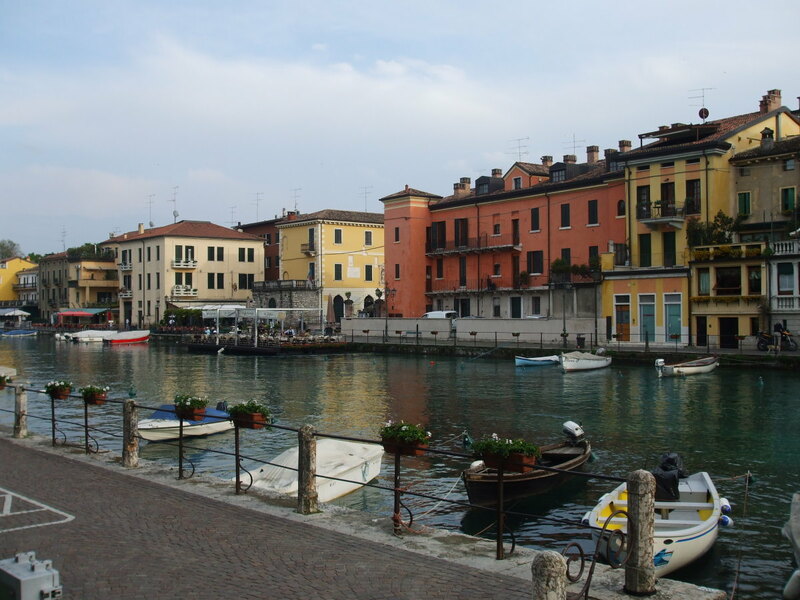 Towns like Peschiera, the fulcrum of transport in the area and a popular place for tourists from abroad and locals in the region. 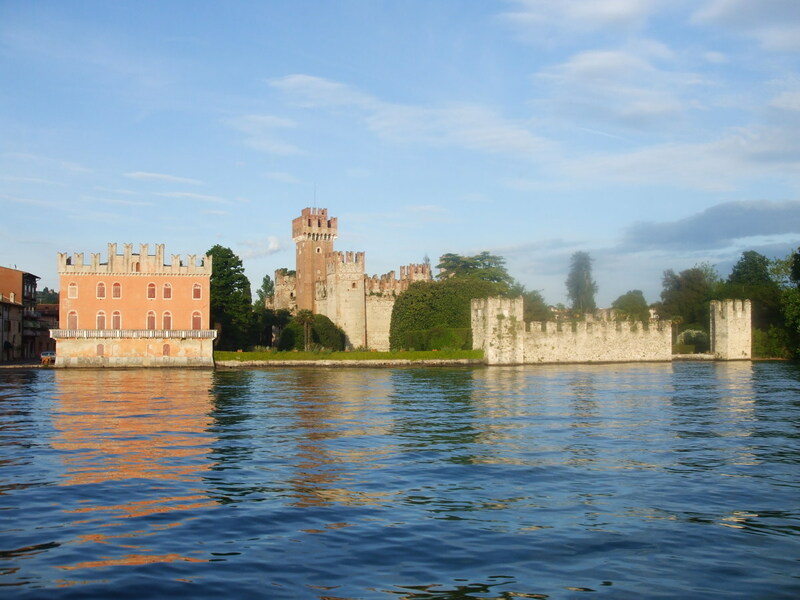 The peninsula of Sirmione, home of Opera singer Maria Callas and an ancient 15th century castle built on Roman remains. 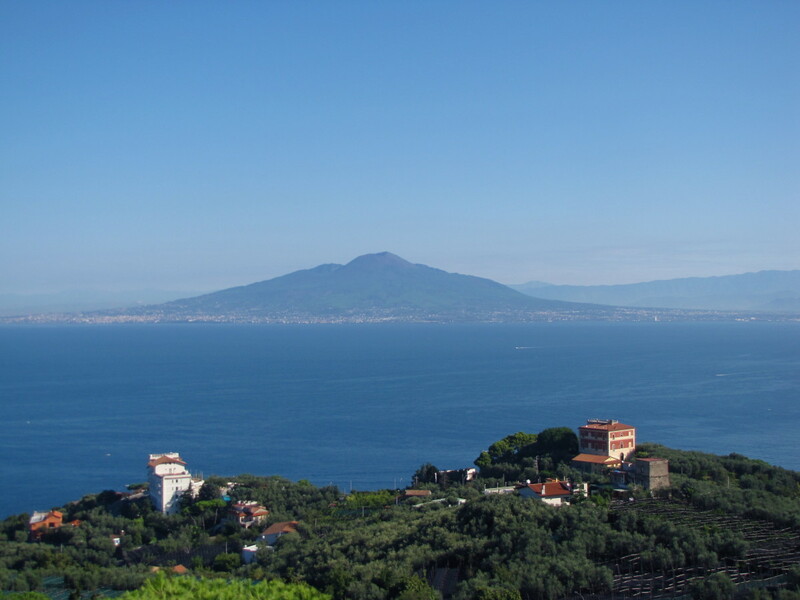 It also contains the Grotto of Catullus and hot sulphur springs at the shoreline discovered in 1889 by a diver excavating the earth. 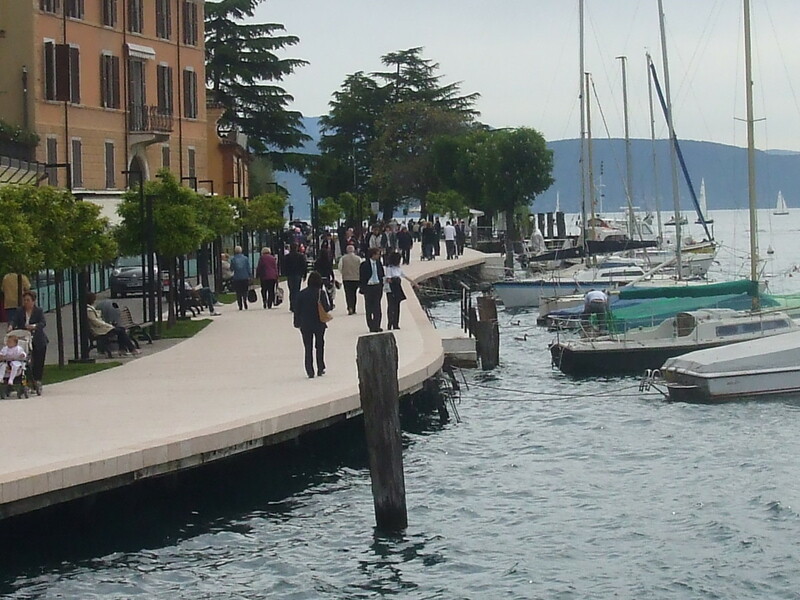 Then there is Desenzano which is the largest town on the lake and a magnet for fashionistas and night-clubbers who come to enjoy its vibrant shopping and sophisticated night-life. These are bustling centres of business, tourism, lively social scenes and many sports and activities. Not to mention the many summer festivals that take place in towns and villages all over the area which see the skies regularly lit up with spectacular firework displays. In a nutshell, the south has more to do, the north more to see. A complementary arrangement forged by nature and which offers something for everybody. All tastes are catered for, all ages considered whether they be party-goers, sun-worshippers, adventurers or simply those seeking a gentle escape from the pressures of modern life. The contrasts continue on the other two shores of Lake Garda which closed in on us as the lake gradually narrowed its course. The east side is wonderful and with its verdant slopes carpetted with woollen green reminded me very much of the Scottish Highlands of my home country. The image was strengthened by the jagged peaks speckled with small islands of melting snow but most particularly it was the graceful sweep of the hills as they flowed downwards to the shore-line. Centuries of glacial ice-flows from the Paleolithic era had carefully sculpted the east side to gently meet the waters of my Italian loch. In fact it is thought that the glaciers actually moved their way along an existing depression moulded around five to six million years ago. On the opposite shore the western side quickly becomes more rugged, foreboding and utterly spectacular. Currently I find the most overused adjective in the English language to be the hyperbolic "awesome" as it is misapplied to the most mundane objects and situations. But the sight of the town of Limone dwarfed by immeasurable tons of sedimentary rock towering over it was a truly awesome sight worthy of the description. The lake was a favourite place for actress Greta Garbo, perhaps when she felt "I want to be left alone" amongst the pleasures of these surroundings and surely she would have been easily cajoled out of her normal taciturn way. There are no graceful contours on the western side and less in the way of lush vegetation. It is mainly hard rockfaces and sheer cliffs which are seemingly cleaved along the shore of the lake. Charcoal grey formations sketched by a determined artist striving to capture the rough and uncompromising beauty of these mountains. 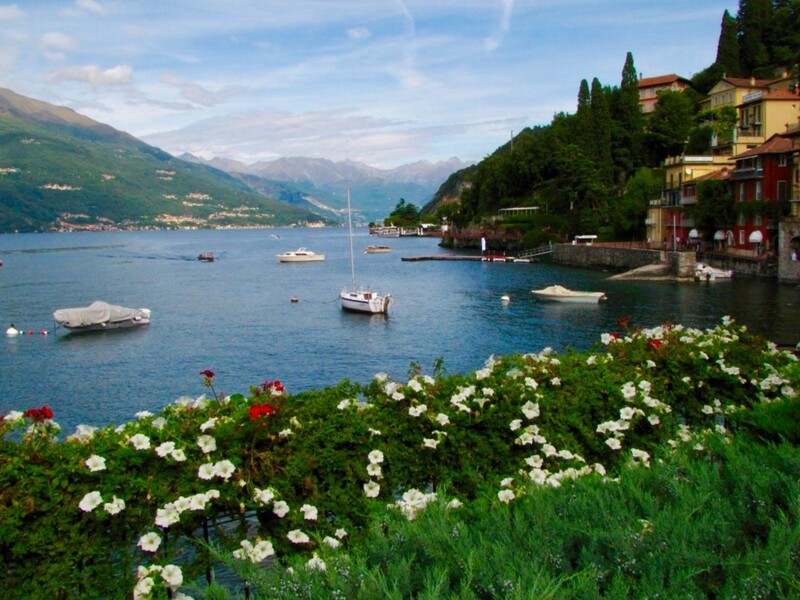 One such artist was Winston Churchill who loved to vacation at Gardone and paint the surrounding landscape. Also along the base of the cliffs you can just make out a succession of apparently small holes which are actually large apertures alongside the many road tunnels that are a feature of the north of the lake. Our first stop on the west side was Saló, a charming town with the longest promenade on the lake and which is famous for being the town where it is said the violin was invented. This was by a man called Gasparo Bertollotti, born in 1540 and who ever since has been known as Gasparo da Saló. It is also infamous as the place where Mussolini retreated to become the Head of State of the Saló Republic in October 1943 after the new rulers of Italy declared war on Germany. After that we stopped at Padenghe which is dominated by its 12th century medieval castle which is still very well preserved. I must admit I wasn't sure at what town I was looking at the time. I tried asking the man next to me in Italian what the name of the place was but he turned out to be a Brazilian tourist who only spoke his native Portuguese. Some you win, some you lose. These mountains have seen many rulers and many armies come and go throughout the centuries due to its strategic importance. From Roman centurions in 300 B.C. after they defeated the Gauls to the 18th century soldiers of the Austrian army which has left a heavy influence on the culture and architecture of the area. In between the waters of Lake Garda have been witnessed by the Lombards in the wake of the collapse of the Roman Empire in the 5th century, the Carolingians in the 8th century and again by the Lombards the following century. Even the Magyars, the Saxons and, on the western side, the Spanish in the 16th century, have staked a claim to the lake. The Scaligeri family of Verona ruled much of the lake for 300 years until the Venetian Republic took over in the 15th Century. However, the original settlers date as far back as 4,000 B.C. and who lived on the south-western side which is now the modern region of Brescia. The mountains above Limone seemed as if they had been brushed by a giant comb such were the artificially straight grooves raked into the rock. An unusual sight were many trees lines along the ridges and peaks. I would have thought that they could not survive or thrive in the strong winds that can buffet the high-ground of the area. 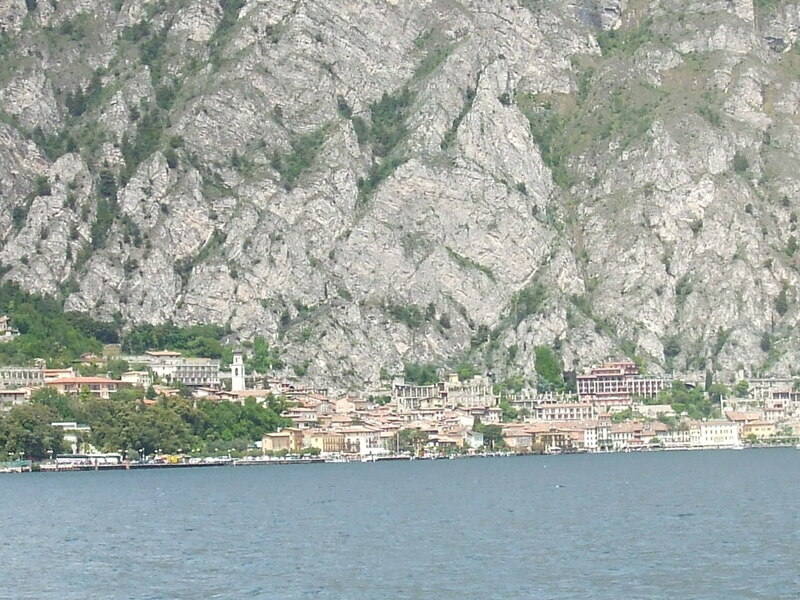 Limone itself seemed like an extension of the cliff-face as if it had emerged as a natural outgrowth of the land. There are also some small pebble beaches on the shore-line for sun-bathers to chill out in-between swimming in the lake. But I was also struck by the sight of a metal fence that stretched right along the rock-face above the rooftops of the town. I could not help thinking that any determined climber brave or skillful enough to scale the cliff would hardly be put off by a paltry fence. Certainly not legendary super-spy James Bond who was here in 2008 on one of his many missions. Action scenes for the movie ‘Quantum of Solace’ starring Daniel Craig were filmed here, including an exciting car chase along the lakeside. Unfortunately a driver delivering an Aston Martin to the location crashed through a fence and plunged it into the Lake. Luckily he suffered only minor injuries but the world's media gleefully recorded the wreckage of the £134,000 car being fished out of the water. 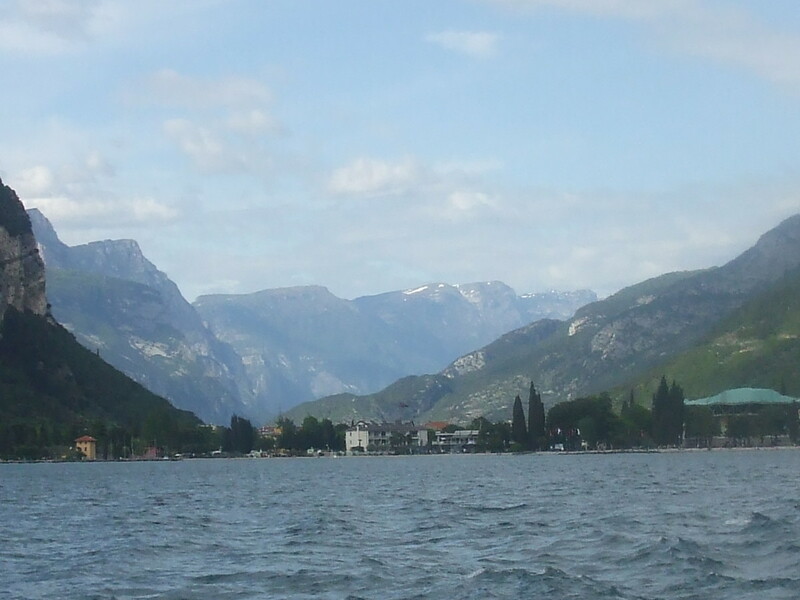 The immensity of the view was difficult to take in given how close we were sailing by on the lake. You can easily lose perspective, confuse the sense of scale and distance as you almost feel that you can just reach out and touch the cliffs. It is as if they seem to be right in front of your face. These mountains are majestic, they are grandiose examples of natural skyscrapers that have stood for millennia and witnessed human history evolving at their feet. An aeroplane flew overhead and on this relatively clear day I'm sure some passengers were marvelling at the sight below. "Give me a call" I thought to myself, "I'll describe how they look from close up" and tell them "Yeah! it's that good!" I'm always willing to oblige. It was then that I noticed 'Napoleon's Nose' protruding from the high ridge in front of me breathing in the cool mountain air. If you turn your head you can see what looks like the profile of a face on the outline of the rocks. 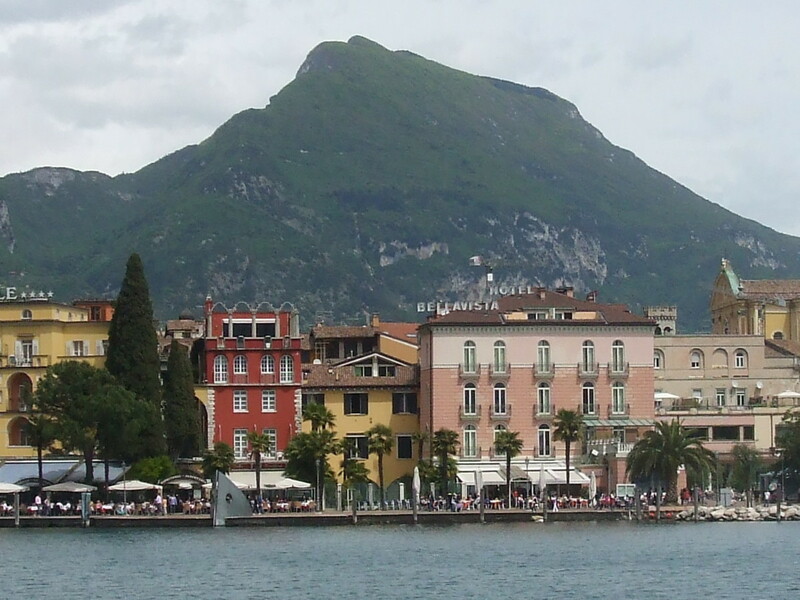 The end of the outward journey was the ancient port town of Riva del Garda right at the northern extreme of the lake. The town was part of the Austro-Hungarian Empire until as late as 1918 after the First World War. This was much later than other towns further south which joined the newly independent Italy in 1861. The Austrian influence is very strong in its culture and you will find many examples of fine Austrian beers in its bars and cafes. In fact around the lake I found that German was the favoured second language amongst many Italians. Riva is naturally very popular with Germans and Austrians but also with British visitors, probably more so than many other towns on the lake. I spent a few hours there relaxing, taking in the sights and sounds and after a snack and a couple of drinks waited for the return boat. The trip back was on a car ferry, a slow boat that would creep along the waters for over three and a half hours to its final destination at Peschiera. But I was never once bored during all this time. The vehicle section of this open-decked vessel had no cars boarding throughout the journey. Therefore, myself and some other tourists and locals had a free run of the deck and were able to wander back and forth from bow to stern. All the time taking in the different views and capturing them with our cameras for ever. My fellow travellers all eventually retired upstairs and a kind Danish lady asked if I wanted to join them. "It is warm upstairs and you can still enjoy the view"
"I'm not cold" I replied, "I'm Scottish"
For it was indeed true. I didn't feel cold at all and in fact the breeze flowing through was cool and refreshing to me with the added advantage of no exhaust fumes to choke me out of my enjoyment. So I stayed put on my own, prowling the deck like the captain of my own ship, sometimes sitting down in contentment, sometimes lying back to gaze up at the blue Italian sky and sun-tinged clouds but always marvelling at the breathtaking scenery. 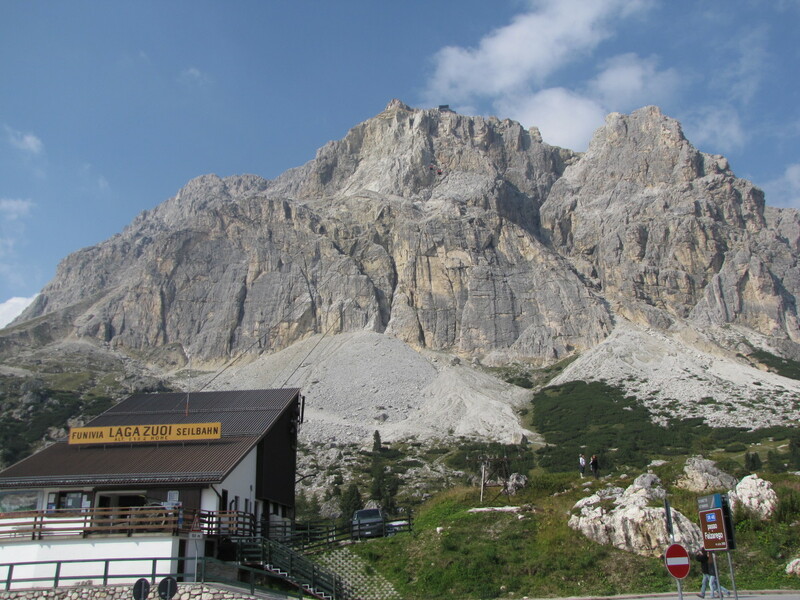 We passed by the little village of Torbole which hugs the calcereous rocks of the north-western slope of Monte Baldo. A place of such visual splendour that it has attracted artists, writers and poets to marvel at the village throughout the centuries. 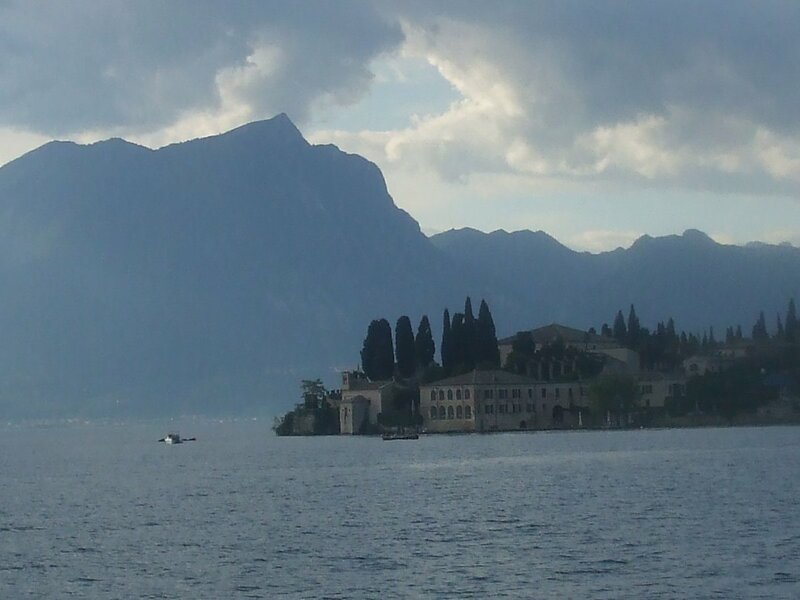 People like the ancients Virgil and Catullus, other poets such as Lord Byron and Ezra Pound as well as the writers Dante, Kafka and D.H. Lawrence have walked the shores of Lake Garda. Nowadays with the obliging winds coming off the Dolomite Mountains the waters around Torbole are a popular section of the lake for wind-surfers and sailors. It was here in the year 1439 that an incredible feat of human endeavour took place. 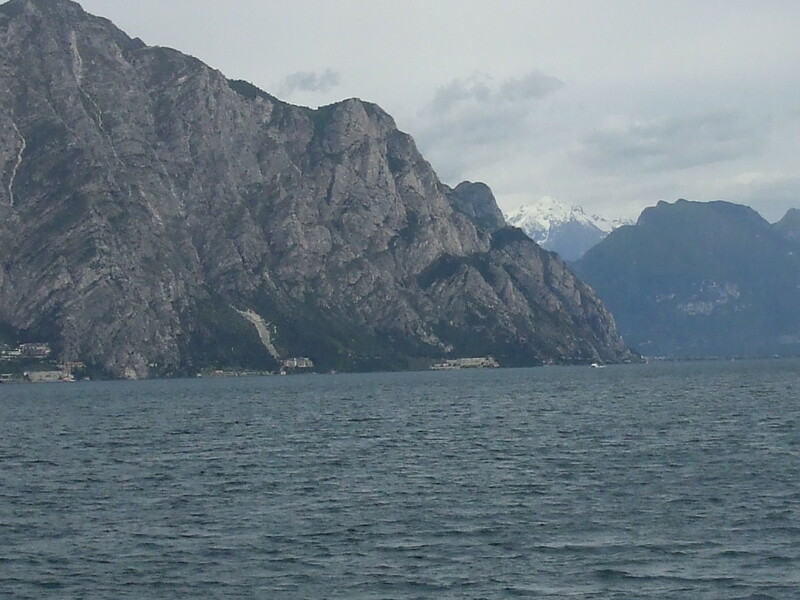 A total of twenty-five ships and six Venetian galleys arrived at Torbole after being transported from the River Adige and across the San Guiseppe Pass. They had travelled all the way from the Adriatic Coast to the port of Mori on the River Adige. But from there they were carried overland on carts pulled by men and oxen. 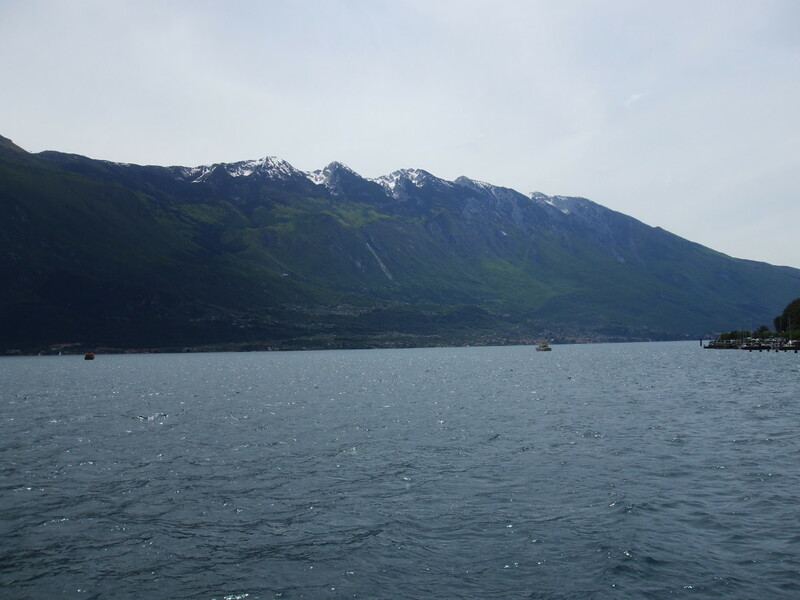 After being lowered down the slopes of Monte Baldo and floated on the lake they then destroyed Riva and broke a siege imposed by forces from MIlan. An extraordinary achievement to transport these vessels across mountains and who could blame the forces of Milanese ruler Filippo Visconti for being taken by surprise and suffering defeat. 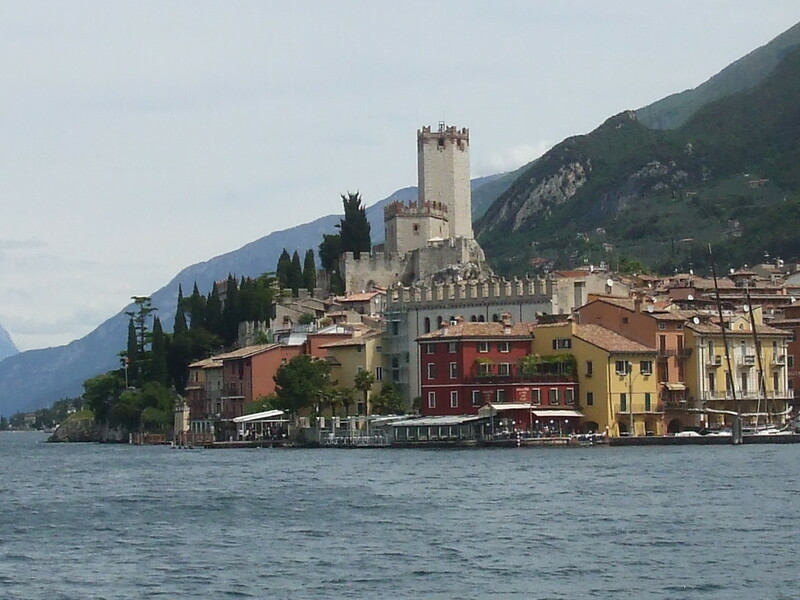 The picturesque town of Malcesine was a pleasant sight with its cluster of buildings at the base of Monte Baldo. The town was the headquarters of the Venetian rulers until the late 18th century. The castle and its tower dominate the terracotta rooftops of the town and remains as it was in 1786 when the famous Johann Wolfgang von Goethe sat sketching the building. Unfortunately the locals thought he was an 18th century version of James Bond. They accused him of drawing important buildings for the purpose of spying for the Austrians. But after accepting his earnest reassurances he was allowed on his way in peace and good wishes. We stopped at Brenzone where again I marvelled at what seemed to be giant steps cut sideaways into the mountainside. The land around here was difficult to negotiate until the lakeside road the 'Gardasena' was opened up in 1930. Prior to that mules negotiated the narrow paths and gorges carrying or dragging produce between villages. It reminds you how important travel by boat must have been in years past. Then at Castelletto where many Italians were strolling alongside the shore on their early evening 'passegiatta' and lovers embraced as they sat together on benches by the water. A girl was stroking the hair of her paramour on one and on another a couple kissed passionately, oblivious to the world around them. And here is where over 30 years ago the famous 'Stone of Castelletto' was discovered by some workers who were building a new house. 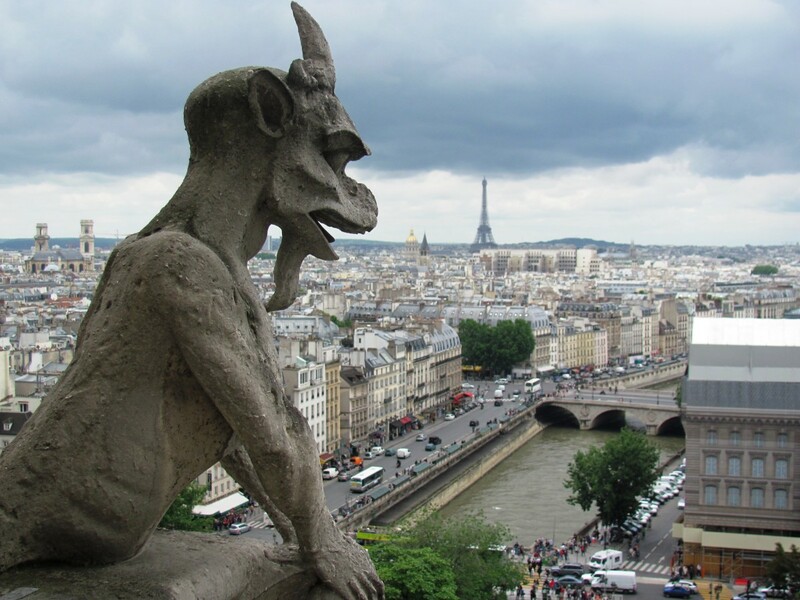 The stone turned out to have inscriptions carved into its surface that date from 4,500 B.C. and today is on display in Brenzone Town Hall. So my day on the lake was coming to an end as the sun gradually lowered down towards the mountains. We returned to the famous wine-growing area of Bardolino on the way back. This is the scene of the 'Festa dell'Uva' in the autumn when lovers of the grape descend for the annual wine festival. Then the attractive sight of the crenellated ramparts on the huge walls surrounding Lazise quickly came into view. The familiar 'fish-tale' outlines of the Scaglieri family style visible along the fortifications on its town walls and castle which were built in the 10th and 11th centuries. 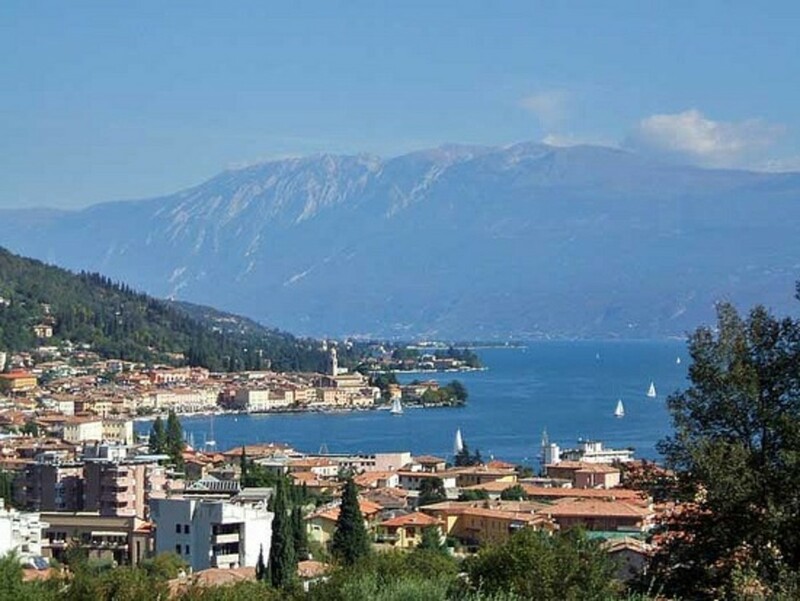 We then embarked for Peschiera and journey's end, a place described by Dante as "All the waterfalls gather there" since it is here where the lake, fed by mountain springs, syphons into the River Mincio. Arriving in the twilight of a Sunday evening I disembarked with a sense of fullfillment and quiet satisfaction. The glories of the lake and the beauty of its landscape and architecture will be etched in my memory. I am not ashamed to admit to having felt an incredible sense of wonder and euphoria on this day as I marvelled at this special place that is Lake Garda. It had been a remarkable journey and a thrilling experience. 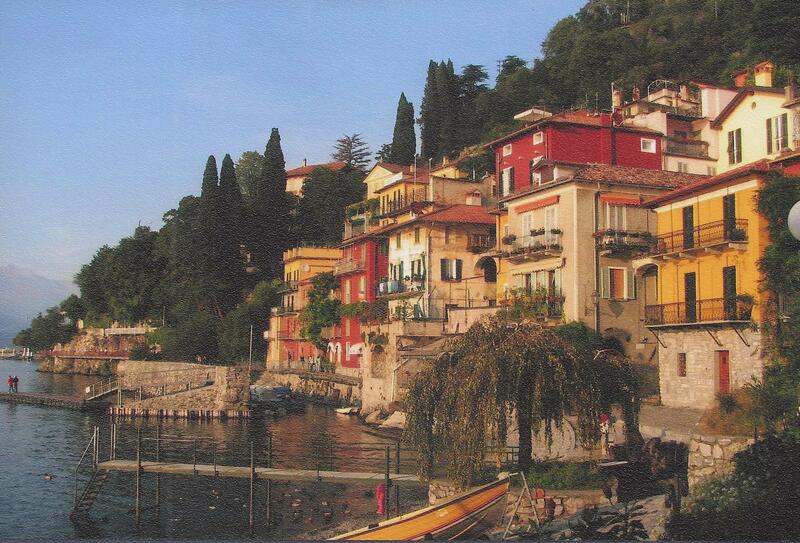 Lake Como, Italy: For "The Sweetness of Doing Nothing"
Get on the train Emma :-) While the weather is good. After living here in the south of Italy for ten years, and translating endless publicity for them, I had no desire to visit the Lakes. This morning, you've twisted my arm...! Bravo Shinkicker! Beautiful! Thanks for the tour! Next time it will be an adventure in the Scottish Highlands for me. Not so rough--- very smoothly done, Shinkicker!!! It's a beautful part of the world, thanks for your comment. I had to vote this one up! Beautiful pictures!